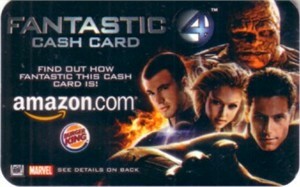 Credit card size cash card distributed by Burger King and sponsored by Amazon.com to promote the Marvel movie Fantastic Four. Back has code (scratched off). ONLY TWO AVAILABLE FOR SALE.